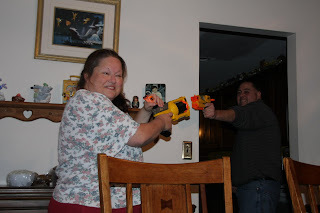 My World---Ryan: WAR on New Year's Eve!!! 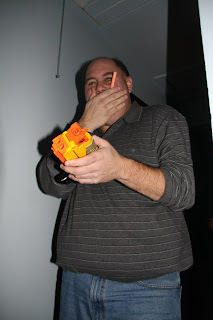 Here are pics from our biggest nerf war yet. Everyone was involved, (well I took pics and Bethany, well she just dodge bullets) we actually had about 3 wars that night but this was the big one. 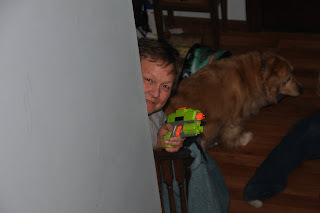 At one point Dad, David and Julia had Ryan, Kevin and Aaron trapped upstairs. They had the stairs covered. 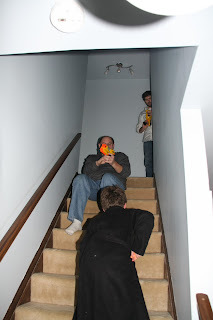 Then next thing we know the front door comes flying open and Ryan and Kevin come down the stairs shooting, David is screaming and running being assaulted from all side. Aaron had climbed out the window and down the house from upstairs, the boy is nuts!! Aaron went just a little more crazy that night!! 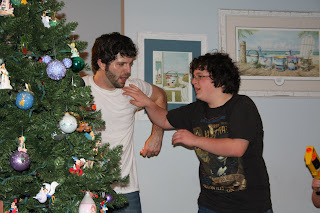 The boys also kept tackling each other. We also had tons of food and played other games. Like Amish dice and Tri-Bond. Then after midnight we started our annual beauty treatments, including facial mask, hair coloring and of course parrfin waxing!! More pics too come. Your Christmas looks like fun, but your New Years looks like way more fun! haha! My boys have millions of darts and guns. 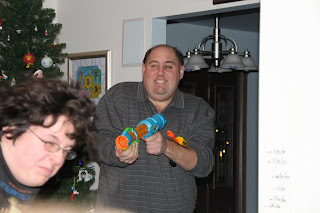 Jacob got the new automatic firing one for Christmas. 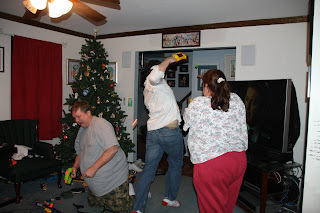 We have battles sometimes and then go on mad searches for the darts. I'm glad you had nice holiday's. I'm catching up on everyone's lives now. 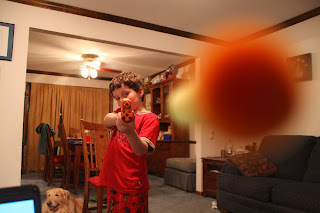 I can't believe you got a pic of Ryan shooting right at the camera! That looks like fun!! I love the pic. with the dart right by the camera.